« WINTER STRIKES BACK, IT’S TIME FOR SOUP! Sally, that looks great! Truly bewitching. Can’t wait to try it. Thanks for the recipe! Sally, magnificent colour, almost a burnt orange! I love carrots, so we’ll give this a go, thank you! Giada has some good recipes, but I changed the method slightly – the way the recipe is written in the site people were complaining the puree was not firm enough. Also, in the show she processed the mix while adding a lot of olive oil – but skipped that in the written recipe. I omitted it, and we definitely did not miss it. 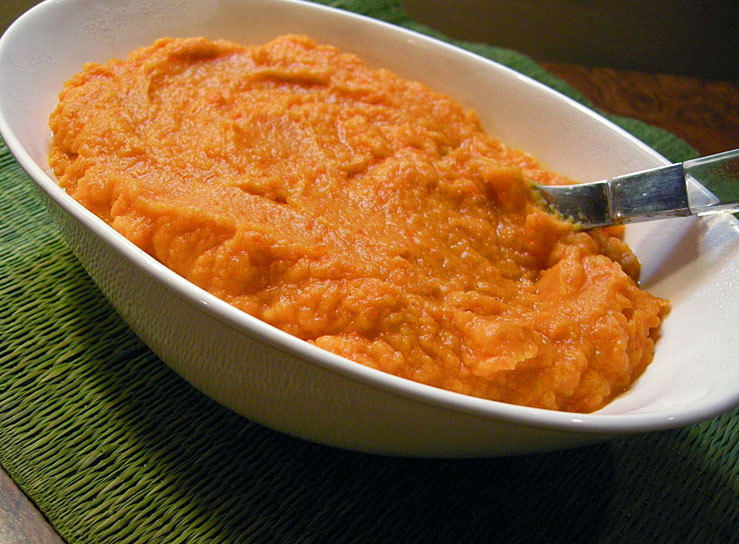 I eat sweet potatoes (and carrots) all year ’round… But wouldn’t this be wonderful for Thanksgiving? So nice. My husband took one bite of this and said, “This is amazing!” My kids requested the leftovers for dinner tonight. Delicious. So glad you enjoyed it! If I was going to cook this Thanksgiving, that would be on our menu, but once more we’ll be away from our own kitchen, and I’ll miss another opportunity to blog about a Thanksgiving turkey…. such is life!